Starting a cleaning business in a recession? Starting a cleaning business during a recession may seem foolish. It may be. But it may also be brilliant. Recessions have a nice way of weeding out fly-by-night cleaning business operations that may have started up for less than ideal reasons, or are on the brink of failure anyway. This creates more space in the market for a really solid start-up business, such as yours. Recessions affect the middle class much more dramatically than they do the wealthy. Further, the recession can affect the under-performing cleaning professional as much as the middle class client. You can avoid becoming an under-performer. All you have to do is educate yourself beforehand. Opportunity awaits you in a recession. In my experience, starting a cleaning business during a recession, and targeting the wealthy, results in discovering receptive new clients. This is because they will have difficulty finding a reliable cleaner. This is usually the case anyway, but even more so in an economic downturn. The surprising truth is that by catering to the wealthy you can recession-proof your cleaning business. 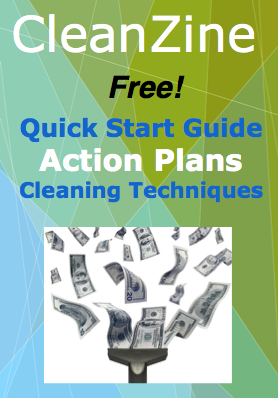 How will offering your service to wealthy people recession-proof your cleaning business? Here's how: The wealthy have a different set of reasons than middle-class clients, for cleaning their investments -- homes, offices, carpets and windows. Middle-class clients view having a house-cleaner like a luxury, a stepping-stone in achievement. However, a wealthier client views house-cleaning as a staple necessity, a tax write-off, and a protective maneuver for an investment -- keeping up the value of the property. Here's why: It would be a poor use of your time to clean your own home when you make $200 an hour (unless you enjoy it). But when you make $20 an hour and pay your house-cleaner the same, well, it makes more sense for you to do it yourself. The bottom line? The client who earns less tends to cut the cleaner loose during an economic downturn. Wealthy clients keep the house-cleaner on. Why do most cleaners decide not to clean for wealthy clients? Many house-cleaners feel more comfortable and confident working within their own class, or in a class slightly above theirs. However, it's possible to learn how to grow beyond that self-limiting attitude and find more job security working for wealthy clients, the same way we did. Another obstacle to securing wealthier clients is that access to their communities can be trickier. However, the work is more secure and the payoff is higher. Don't use that challenge as an excuse not to try! One reliable way to get in front of the wealthy is by having a professional, high-quality website. As a pro-member, you can get a free professional website for your cleaning business start-up. Don't let the fear-mongering in the media stop you from improving your professional life. Turn that recession into an advantage by changing your perspective and approach. Starting a cleaning business is easier than ever, even during a recession. In addition, by starting your cleaning business during an economic downturn, you can actually recession-proof your cleaning business. These are the small business resources we recommend to help you with the more general aspects of starting a cleaning business. These resources can apply to any small business. We have been researching these websites for over six years now, and we think the following Web sites are the best. Learn what the IRS recommends when starting your own cleaning business. My Own Business seeks to educate entrepreneurs by providing free courses to foster success and prevent economic losses arising from preventable mistakes.